DINA MERI Mani Roll-EX 330 Or 331V (Vented) Manicure Table - High impact black polystyrene construction in textured finish. 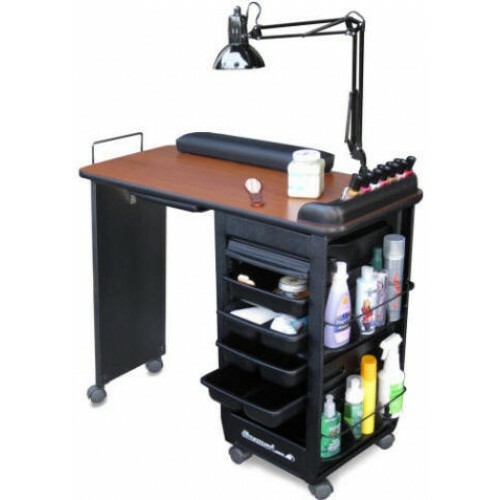 Includes 4 assorted trays and 4 side pockets, roll-up lockable door, 4 heavy duty casters for easy mobility. See Color Selection. *Side Panels are an Up charge. TOP FEATURES: Large work surface in high pressure laminate available in your choice of colors, See Color Selection. 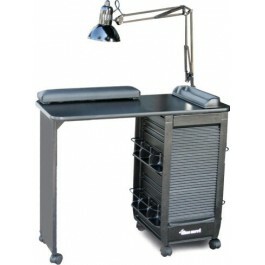 Chrome tray support, swing arm lamp, polish rack and padded armrest.